Today, I’m honored to turn this space over to award-winning author, damn good writer, promoter, and friend Gail Z Martin, for some yattering about her favorite holiday and what trouble she has bubbling away lately! I love Fall. It’s cooler and cozy, perfect for curling up with a hot cup of tea or coffee and a good book. And it’s the time of the year for my second-favorite holiday—Halloween! What’s not to love? 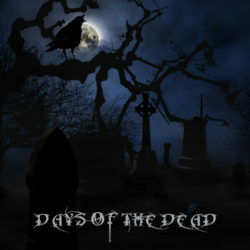 It’s also the season for All Hallow’s Eve, Samhain, and Dia De Los Muertos (Day of the Dead). This year, Trick or Treat season has a LOT more treats in store with THREE big events all going on at the same time! First off, there’s my annual Days of the Dead blog tour, which is bigger and better than ever—so big it has its own blog post just to tell you all about the giveaways, 40 international blog partners and big surprises. There’s something for everyone plus reveals of the covers for Vendetta, the new Deadly Curiosities novel; No Reprieve, the new Blaine McFadden short story: Spook House, the new Deadly Curiosities short story with a Halloween theme; Arctic Prison, the first in a new series of Blaine McFadden novellas set in the Ascendant Kingdoms world and more! You won’t want to miss a thing—including a TON of links to excerpts from my books/stories/anthologies and a SLEW of my author friends! Go to www.AscendantKingdoms.com to get the details! Then there’s the Full Moon Blog Tour, where I’m one of 25 bloggers with October-fantastic musings and a NEW set of giveaways. All of the authors are members of Broad Universe, which promotes women writing speculative fiction. Of course, the blog tour and three big book giveaways are open to everyone—you don’t have to be a member or female to enjoy or win! Details here. And there’s even MORE! I’m one of 11 bestselling authors who are offering you a chance to get The Swaggiest Swag for free! All you have to do is send a self-addressed, stamped envelope (ok, it’ll cost you a stamp and an envelope) to get cool bookmarks, postcards, book swag and neat-o stuff from folks like Faith Hunter, David B. Coe, Laura Anne Gilman, Darynda Jones, Christina Henry, Stuart Jaffe, John Hartness—and me! You can find out more about it here, but hurry—this Swaggy offer turns into a pumpkin and goes away on 11/1. So stay tuned to my Winter Kingdoms Facebook page, the AscendantKingdoms.com web site, my DisquietingVisions.com blog. Best of all, join my Chronicles newsletter to make sure you don’t miss any of the October-awesomeness because I’ll be posting new stuff throughout the tour! My Days of the Dead blog tour runs through October 31 with never-before-seen cover art, brand new excerpts from upcoming books and recent short stories, interviews, guest blog posts, giveaways and more! Plus, I’ll be including extra excerpt links for my stories and for books by author friends of mine. You’ve got to visit the participating sites to get the goodies, just like Trick or Treat! Details here. Trick or Treat! 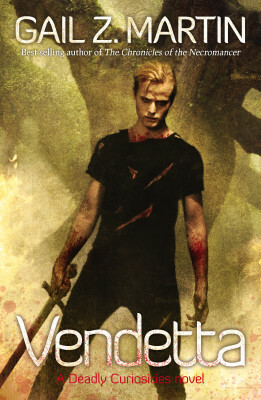 Excerpt from my new urban fantasy novel Vendetta, set in my Deadly Curiosities world here. 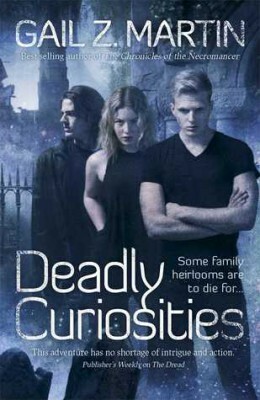 Enter to win a copy of Deadly Curiosities! Enter to win a copy of Iron & Blood! Halloween loot! Read an excerpt from Wicked Dreams, another one of my Deadly Curiosities stories! 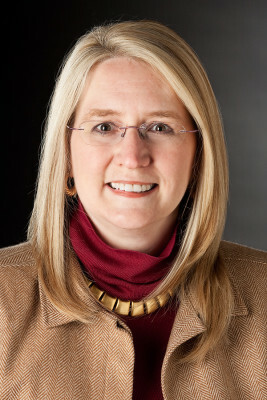 Other books include The Jake Desmet Adventures, a new Steampunk series (Solaris Books) co-authored with Larry N. Martin, as well as Ice Forged, Reign of Ash and War of Shadows in The Ascendant Kingdoms Saga, The Chronicles of The Necromancer series (The Summoner, The Blood King, Dark Haven, Dark Lady’s Chosen) from Solaris Books and The Fallen Kings Cycle (The Sworn, The Dread) from Orbit Books and the urban fantasy novel Deadly Curiosities from Solaris Books. Broad Universe is an international non-profit organization dedicated to promoting, encouraging, honoring, and celebrating women writers and editors in science fiction, fantasy, horror and other speculative genres. 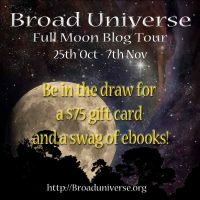 Click on the graphic at left to find out more about the Full Moon Blog Tour, or click here to find out about Broad Universe itself.